Most urban environments don’t need more cars. Most times, they need fewer cars. Zipcar has joined the solution to problems of space, parking, congestion, and air pollution in yet another way (aside from its leadership in carsharing). 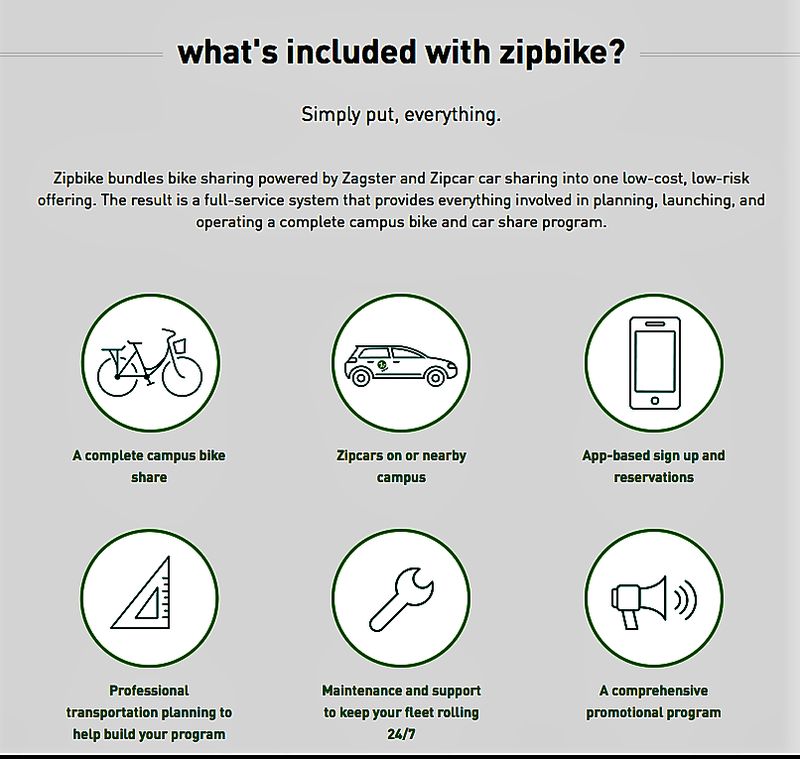 Zipcar recently decided to launch Zipbike, a partnership with a startup called Zagster. The new vehicle-sharing venture is not about cars — as you might have guessed. Zipbike will launch in January in 10 college campuses, and 15 by the end of 2017. Zagster already runs a bike-sharing business and charges schools a $150 monthly fee per bike. Zipbike will cut that amount by 90%. New customers will be able to sign up just for Zipbike, or they can get a discount if they sign up for both the bike-sharing service and Zipcar’s car-sharing program. A rental car now and then is a convenient option, enabling more people to sell their cars or not buy one, but making bicycles more accessible is another way to have the same effect. Bike shares and car shares minimize personal vehicle use and ease demand on overburdened transit systems. Fewer cars reduces campus gridlock and improve air quality. Save students money & hassles. Students who don’t bring cars to campus save around $20,000 over four-year enrollments, according to Forbes. Students who don’t own cars don’t face the burden of permits and parking tickets. Building a single new parking space in a structured garage costs on average $20,000 to $40,000 for a university. Fewer cars on campus frees up space and decreases parking-related woes and costs. Decrease theft & abandonment. College students have a 53% chance of losing bikes to theft. Bike sharing reduces theft and the need to manage abandoned bikes. “We expect Zipbike to become the leading national collegiate bike sharing brand, and ultimately become synonymous with the category,” Zipcar writes. Zipcar’s new Zipbike fits right in. Bike sharing is a plus for any community. Thank you, Lulu, for your solution.